AgilEase for Joint Health, especially beneficial for athletes. Also a great supplement for middle-aged and elderly people who may experience a natural, acute inflammation response in their joints after exercise. 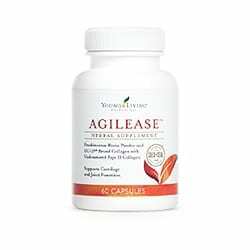 AgilEase was formulated for Joint Health to support your joints so you can keep on living the life you love! Our joints are often the first to feel our age or the effects of fthe requent vigorous athletic activity. Even healthy individuals need support for the natural acute inflammatory response that often comes with exercise or a little help promoting joint flexibility and mobility to support your active lifestyle. The combination of boswellic acid, UC-II® undenatured collagen, hyaluronic acid, and calcium fructoborate works to help support joint and cartilage function. We specifically chose 100 percent pure, therapeutic-grade Wintergreen, Copaiba, Clove, and Northern Lights Black Spruce essential oils to support joints. It’s perfect for individuals who are looking to keep up their active lifestyles by supporting joint mobility and flexibility. This supplement can reduce acute joint discomfort and support the body’s healthy response to inflammation from exercise. This synergistic formula delivers results in smaller doses than most joint supplements, in just two daily capsules compared to others’ four daily capsules. Take AgilEase to improve joint health or as a preventative measure to protect joint and cartilage health. It is especially beneficial for athletes and active individuals of all ages who want to support their joints and cartilage.